Discover the highest ski resort in Europe Located in the famous Tarentaise Valley in the French Alps, Val Thorens is the highest ski resort in Europe at 2,300 metres of altitude. Val Thorens ski resort belongs to the 3 Valleys ski area which offers 600 kilometres of slopes across 8 worldwide famous French ski resorts. Skiing in Val Thorens Open from November to the month of May, Val Thorens is located in a vast natural cirque and is overlooked by 6 glaciers. This unique situation is ideal for skiing all day long in the sun. Since 99% of the ski area is above 2,000 metres of altitude, skiers are guaranteed to enjoy the snow during they ski holidays in Val Thorens. If you are into snowparks and family fun, the resort offers different fun areas for the whole family to enjoy. The Fun Slope is a funny course strewn with obstacles, with over 50 game modules, including snow tunners, bridges or spirals, both for skiers and snowboarders of all ages. Val Thorens Snowpark is a 70,000 m2 of jumps, rails and boxes for both skiers and snowboarders as well and is a fun time for everyone to enjoy. Your Val Thorens Accommodation Residence Le Tikal Our Pierre et Vacances Residence Le Tikal is located in the village centre and is a ski-in ski-out facility. The apartments are ideal for families since the ESF nursery is close to the resort. Recently renovated, the modern apartments offer accommodation ranging from studios for 2 people to 3 bedroom apartments for 8 to 9 people. Some apartments offer a beautiful view on the mountains with a balcony. 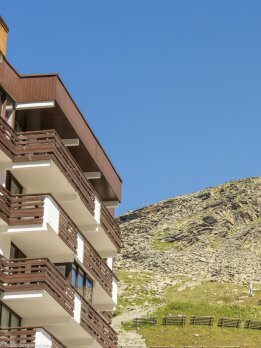 Your ski apartments val thorens in Residence Le Machu Pichu Residence Le Machu Pichu is located in the resort centre and offers modern and functional apartments with a beautiful view on the slopes. The facility is ski-in ski-out and gives access to a relaxation and fitness area to relax after a long day on the pistes.